Welcome to Lakeside Family Fun! This home has all you need for your large gathering of family and friends! Located in Lakeside, guests have close access to Lake Michigan. It is only a half-mile walk to the Berrien Street Beach in Union Pier, or a short drive to the private Cherry Beach, for which this property has a parking pass. 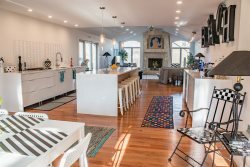 The large and spacious open floor plan on the main floor allows a seamless flow through the kitchen, living, and dining areas. The kitchen is fully stocked and equipped with stainless steel appliances. There is plenty of countertop space including barstool seating so you can hang out with the chef while they prepare your gourmet dinner. A wood burning fireplace is the focal point of a large living area, which is furnished with large, comfortable sofas. Adjacent to the living room is a dining table with seating for 6. Two side by side master suites are housed at the north end of the house on this main level. Both suites are furnished with king beds, flat screen TVs and en suite bathrooms, each with jetted tubs. The upper level has 4 bedrooms- one bedroom with a king size bed, one with a queen size bed, and two bedrooms each with two full beds. The bedrooms have mounted flat screen TV's and share a full bath and a powder room. The upper bedrooms either have access to the large deck or have a private deck. A unique aspect of this level is a balcony with a sitting area which overlooks the living area below. The main level also houses the newest addition to this property- a terrific game room, which is located in the garage. This game room includes a bar, a pool table, a foosball table, a ping pong table, and a card table. You can keep this room closed off if the weather is inclement or open it up during the breezy spring, summer, and fall days. The basement is finished with a large TV viewing room, and another bathroom with a shower. There are also full laundry facilities between the first floor and the basement. The outdoor space is phenomenal! The large and spacious deck space, is a great place for the family to gather on those warm summer evenings, as it has plenty of seating and a dining table for eating al fresco. There is also a 6 person hot tub and a portable fire pit. *Please ask about the hot tub if you are booking prior to Memorial Day weekend or after Labor Day weekend*. In short, Lakeside Family Fun is a fantastic getaway in the heart of Harbor Country and perfect for your large family or group to come and spend some time together! Hot tub is usually open in the fall up until Thanksgiving and reopens in spring. Please verify if wanting to come to after this time until the following spring. Excellent all around! No complaints. Always a good experience with everyone associated with Yellow Bird. We have always had a wonderful time here. Our group enjoys this property very much. Everyone is always so kind and eager to accommodate our group. I look forward to working with Yellow Bird Vacation Homes every year. The game room in the garage was phenomenal! Everyone we came in contact with was friendly, knowledgeable, and helpful. This house was a great fit for our large family! We enjoyed all the amenities it had to offer. I've had a really good experience with all of the team members this year and last. It is a great house for a large group of people and we thoroughly enjoyed ourselves. This was our second time renting this home for New Year's weekend. Was easy, no complaints. Wonderful time. Jon was really good at getting back with information that I asked about. Couldn't have asked for anything more. Was easy to find and get to town. Never felt like there wasn't enough room for everybody. The garage was the perfect place to play cards, pool, and to watch sports. Wonderful experience. Great team-- which is why I continue to rent with Yellow Bird Vacations year after year! I was able to check in early and go directly to the house. Someone from Yellow Bird Vacations called (I feel horrible as I don't remember his name... Possibly Dan? I'm so sorry if that's wrong!) and let me know the day of that I could go directly to the house. It was very convenient and was nice having him check in with me. How large and open it is, the space available, the number of bathrooms, and the spacious kitchen and living room. Our favorite feature is probably the game room in the garage. I had no issues working with the team. We had an amazing weekend and the house contributed to that experience immensely. Overall a great experience and beautiful home!!! spoke to John Darby several times throughout the planning of our trip and he went above and beyond to accommodate and made me feel welcome. I really appreciate it and it's a quality that I feel is often times missing so when I get the level of customer service he provided I am grateful and more likely to do business with them in the future and refer others. Thanks John! This was the best house we've rented to date and we really dreaded leaving. We are already looking forward to the next trip and we will look to Yellow Bird Vacation rentals to accommodate us in the future. We had a wonderful time celebrating at this property. It was roomy, well-styled, and had a ton of amenities to cater to any fun-driven occasion. I highly recommend this property!